2019 marks the 150th anniversary of America’s first baseball team, the Cincinnati Reds. 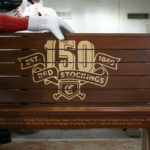 Stanton Millworks has enjoyed a long and fruitful partnership with the Reds, and so they were honored to take on a series of commemorative Reds benches. These benches have been placed in various locations throughout Cincinnati, and feature a sculpture of Mr. Redlegs in the various throwback uniforms to be worn by the Reds during the 2019 season. Check out another Stanton project with the Reds. These beautiful benches are 80″ wide and 34″ tall. Stanton took care of fabricating the benches themselves, as well as the concrete form legs which we made from custom forms. The bench seats were made of ipe with carving details that had to be routed on the CNC. The team had to create a jig for the router in order to space out the carvings, then CNC the carving on the router. After all that, the team sanded everything, sealed it, painted it, and sealed it again.The benches also featured custom metal brackets that were power-coated black for the support structures. Check out local news coverage of the benches. The approachable statues of Mr. Redlegs were created by SVI, a company out of Chicago. Stanton is proud to have been a part of this year’s top photo opp. We challenge you to get a snapshot with all 25 benches!